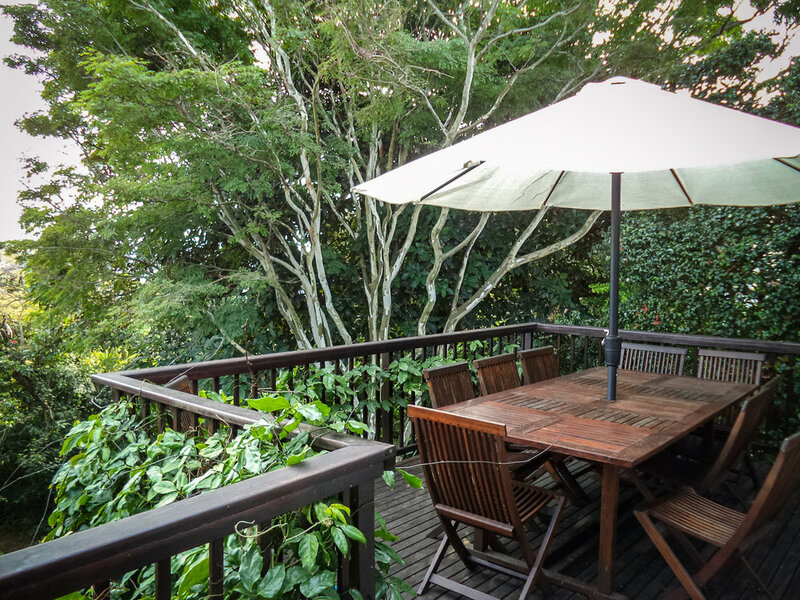 Nestled in the subtropical coastal forest of Southbroom, Laughing Gecko Lodge offers an escape from the city in the convenience of a small town. Lie back and enjoy the sunset over the rambling Imbezane river or breathe in the salty sea air, with tranquil beaches a quick 5-minute walk away. Laughing Gecko offers affordable accommodation with quality facilities, ideal for families, couples or groups. All rooms include linen, towels, tea and coffee station, free wifi, ceiling fan, bathroom amenities and daily housekeeping. Family suite with separate king room, private lounge area with daybed (converts to 2 singles), kitchenette and en suite bathroom. Accommodates up to 4 people. River view. Full DStv bouquet. Perfect hideaway for a couple. King room with en suite bathroom (shower only). King room with easy access to shared bathroom (bath and shower). Additional sleeping space for children or large groups. Two single beds. Shared bathroom (downstairs). Single room with double bunk (ideal for children). Sliding doors onto communal balcony. Shared bathroom. Downstairs flatlet with two double rooms and bunk room (sleeps 4 to 6 people). Private patio with river view, overlooking swimming pool and garden. Lounge, kitchenette and shared bathroom. Full DStv bouquet. Enjoy the sunset over the Imbezane river on our covered outdoor patio, the essence of tranquillity. An additional dining area is available on the deck. The swimming is located towards the bottom of the garden and is easily accessed by a staircase from the deck. Soak up the sun in one of the sun loungers or enjoy a light snack at the patio table and chairs. Comfort is key. Lounge around in any of our comfy sofas and watch a full bouquet of DStv. Make use of any of the books and board games on offer or rustle up a sunset cocktail at our Gecko bar. Laughing Gecko Lodge has a fully equipped kitchen which opens onto a dining area. Fridge, freezer, stove, oven and microwave are available for shared use by all guests. Breakfast is available on request. If you want the convenience of having your midday and evening meals prepared by our team, send us an enquiry so we can advise on our catered package options. Enjoy the sunset over the Imbezane river on our covered outdoor patio. Few coastal villages can boast easy access along the full extent of their coastline. Even fewer can say that their natural heritage has not given way to high-rise hotels and apartment blocks. Southbroom enjoys a 4-kilometre sandy Indian Ocean beach frontage and has protected its coastal bush with passion. The green lungs provided by the well-known Southbroom Golf Club, Frederika Nature Preserve and 350,000 m2 of land zoned to conservation enhance the lush green tropical paradise that nestles between the Mbizane and Kaba Rivers. Southbroom boasts two recognised swimming beaches and the coastal walk between them is truly spectacular, thanks to the pristine condition of the primary dunes. Its two tidal pools further ensure that the needs of every beachcomber are satisfied. The village includes tennis and bowls clubs and adequate retail facilities for one’s daily needs. More comprehensive shopping is provided by the nearby towns of Ramsgate, Margate and Shelly Beach. Southbroom has active community initiatives that coordinate to ensure that the civic pride, value and lifestyle pleasures of the village are protected and maintained. Bask in the spirit of the village, it is one you can proudly call your home away from home. We are located about 178km away from King Shaka International Airport.